The Car 3D LED Illusion Lamp is a combination of art and technology that creates an optical 3D illusion and plays tricks on the eyes. From afar, you will see the design, but as you get up close, you see a thin acrylic glass sheet that's completely flat. It's bound to dazzle and impress your guests while always lighting up the room and your lives. Perfect for displaying in your bedroom, living room, office, as a night lamp or any way you want to use it. 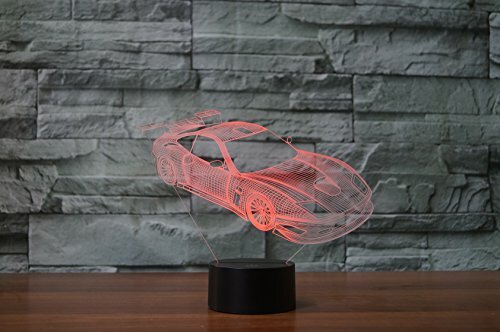 Novelty 3D visual Illusion effect Light : special cool racing car modern design, Perfect for home decoration, creating romantic warm atmosphere.